Floriday.co.uk - New Blue Man Group Show Opens Feb 24th - Florida Holidays, Disney, Universal, SeaWorld - The best of Orlando! Universal Orlando's Blue Man Group show is taking its unique and captivating brand of live entertainment to another level - complete with a new show environment, new music, new technology and new experiences. New sections include Blue Men interacting with "GiPads" (think Gigantic iPads), a funny and perceptive look at contemporary modes of communication; and a pulsating new finale featuring an original Blue Man Group music score that will have guests jumping to their feet. "The heart of our show is, and always has been, the Blue Man, and his inquisitive, wide-eyed take on the world," said Chris Wink, who co-founded Blue Man Group with Phil Stanton and Matt Goldman. "Our team of artists at Blue Man Productions has created fun, even astounding new visual aspects of the show, and our music team has given us a great new sound. We are really excited to incorporate these elements into the show at Universal Orlando Resort". "This show will take one of Universal Orlando's most popular experiences to a whole new level," said Alice Norsworthy, Executive Vice President of Marketing and Sales for Universal Orlando Resort. "It's the perfect complement to the incredible entertainment we offer at our destination." Several of the signature moments that have made Blue Man Group one of today's best-loved theatrical productions will remain in the show, although in most cases, they have also been updated. 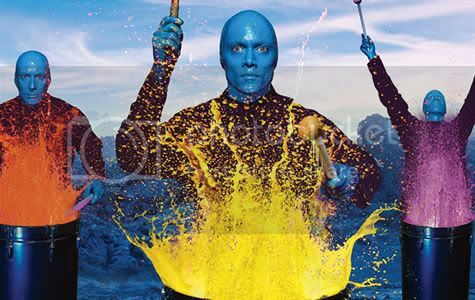 And as always, the production will fuse innovative theatrical spectacle with improvisation and vaudeville-inspired comedy, art, science and irresistible music performed by the Blue Man Group live band. "Many of our audience's favorite pieces, including "Paint Drumming" and "Gum Balls/Marshmallows" will continue to be a part of the production - and yes, the first few rows will still need to wear ponchos," added Phil Stanton, Blue Man Group co-founder. "But we have developed some brand new elements of the show that provide a larger-than-life, rousing, interactive experience that I hope will really speak to all cultures and give some of our most devoted fans a new reason to check us out again." For more information about Blue Man Group at Universal Orlando Resort - or to purchase tickets - visit www.universalorlando.com/blueman.